This plugin integrates your Gravity Form with your Authorize.net account Customer Information Manager (CIM Profile) functionality. It does not charge the customer! This only attempts to create a CIM profile for future use. It is configurable. Please see additional details below. 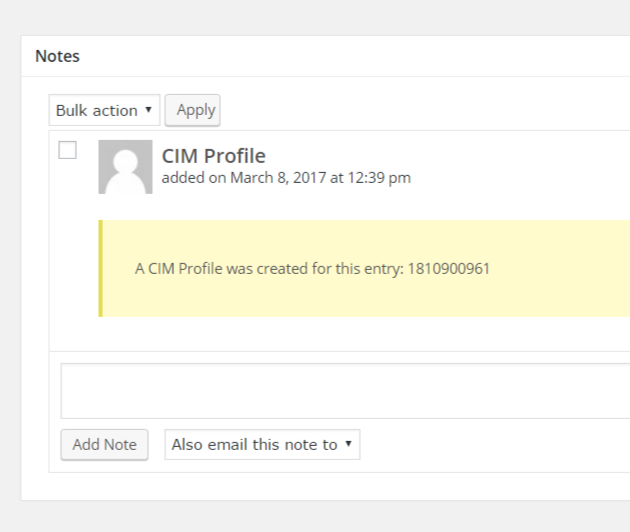 Add the ability to create a Customer Information Manager profile (CIM Profile) through Authorize.net. Upload the CIM Profile plugin and activate. Create a Feed in your form mapping your form fields to any required fields in your form that you want sent to Authorize.net. (See your form’s individual CIM Profile Settings). You can map address, email, description and customer id fields to send to Authorize.net. This step sounds hard but it is super easy. Just matching up the fields in simple terms. 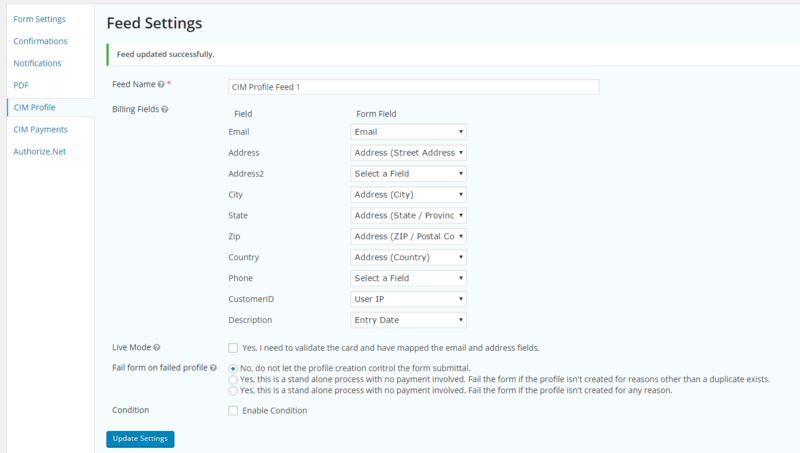 Choose to validate the card or not in Live Mode (billing fields required for validation). If you want to make sure the card is valid before storing the data, you can. Choose whether to fail the form if the profile creation fails or allow the form to submit anyway. Select a condition if applicable (for example if you have a checkbox to ‘Save my card profile’ and it is checked, process the feed). The plugin is built upon a very stable platform (Gravity Forms Feed Addon) so should work for a long time. But I actively develop as needed and will make new versions available after the 12 month window at a reduced price.